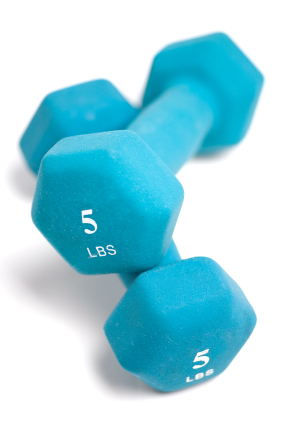 Training with weights doesn’t necessarily mean adding bulk. Lean muscle definition and weight loss are two of the benefits of strength training for women. Add a bit of weight to your workouts to feel and look better this year. Cardio workouts shouldn't be the only workouts you're scheduling to improve your fitness. Weight training for women increases bone density and lean muscle definition, improves balance, stabilizes posture (no more slouching!) and increases metabolism. Strength training for women doesn't need to involve massive amounts of weight piled onto metal barbells. Starting with 3-pound to 5-pound weights — or your own body resistance — can provide all the benefits found in training with weights. Follow celebrity trainer Jillian Michaels' advice for a 3-2-1 plan: 3 minutes of resistance training, 2 minutes of cardio and 1 minute of core training. You can purchase one of her DVDs, complete with her encouragement and innovative moves or develop your own circuit. Completing a 3-2-1 circuit three times provides 18 minutes of fairly intense physical activity. Grab a stopwatch, a couple of light weights and, if necessary, a quick refresher on basic strength-training moves. Combine an upper and lower body strength move during the first part of the circuit to maximize your workout — squats with shoulder presses or lunges with bicep curls are great combinations. Move onto 2 minutes of simple cardio, jumping jacks or high knees and then drop to the floor for a minute of crunches. Completing a 3-2-1 circuit three times provides 18 minutes of fairly intense physical activity. You can add weight or vary your moves as you feel comfortable. Many gyms offer boot camp or body shaping classes with weight training to maximize fitness results. Working out with a group, an encouraging instructor and some heart-pumping music can provide motivation and take the intimidation factor out of adding strength training to your fitness routine. When a busy day gets in the way of gym time, take a few minutes to sneak in some classic muscle-toning moves. Start with 5 mountain climbers, 10 push-ups, 15 crunches and 30 seconds of plank position. Do the four basic moves twice or three times a day, adding additional repetitions when you feel stronger, and you'll definitely notice a difference in your arms, shoulders and abs. Don't let fear of bulky muscles or a crazy schedule keep you from toning up and maybe dropping a few pounds this winter.